Your friends are a special group of users. You can share your portfolio pages or collections easily with them and get in touch with them quickly by going to this page. They differ from a regular group in that they do not have discussion forums, pages or shared files. If you do wish to have access to those with your friends, you have to create a regular group for them. Go to their profile page and click the Request friendship link. Go to the Find friends page and search for potential friends there. The My friends page is the place for you to see who your friends are. All friends: Shows you all current and pending friends. Current friends: Shows you all users whose friendship request you have approved. 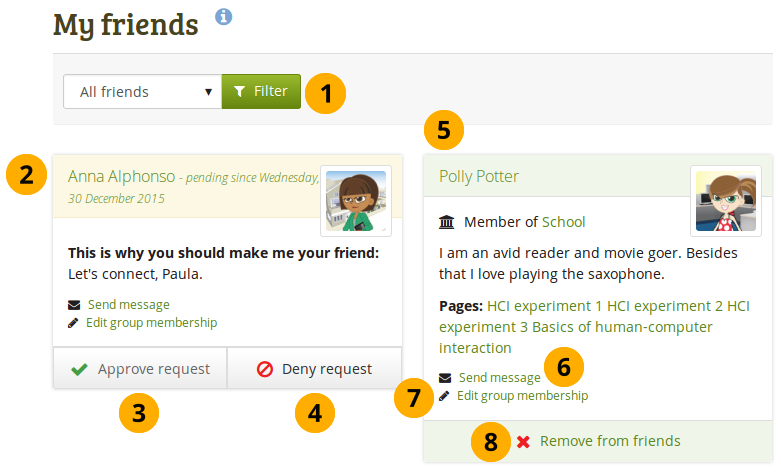 Pending friends: Shows you all users who wish to be your friend, but whom you have not yet approved. For users whose friendship request you have not yet approved, you see their profile picture and the reason why they want to become your friend. They have the word pending next to their name as well as the date since their request has been pending. If a user is in the pending state, you can click the Approve request button to accept their friendship request. Click the Deny request button if you don’t want to become friends with the user. 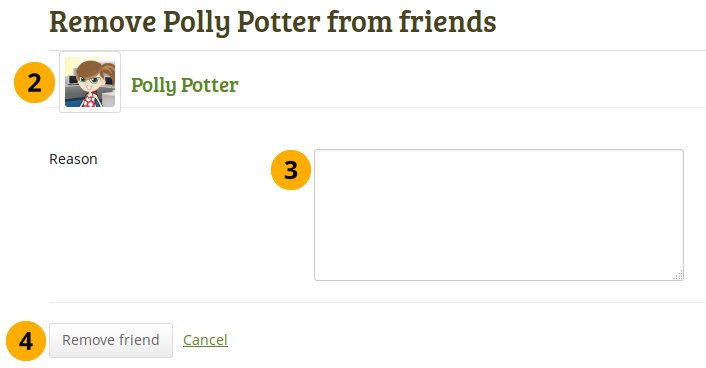 Click on the name of your friend to reach their profile page. See in which institution they are a member, if in any. Read the introduction that this user has provided under Content → Profile → Introduction. The pages of this user to which you have access are listed. Send a message to the user if you wish to do so. This is only possible if the user allowed that. You can change your personal settings for messages from other users in your account settings. If you are a group administrator in a group that one of your friends or potential friends belongs to, you can edit their group membership directly here. If you no longer want to have a user on your friend list, you can remove them by clicking the Remove from friends button. When you click on the institution name that is listed for a friend, you see a list of institution staff and administrators. You can contact administrators directly from this page by clicking on the Send message button. The institution membership is only visible if your site administrator set up multiple institutions on Mahara. Users on a site with multiple institutions who do not have one displayed do not belong to any institution. You can remove a friend from your friends list easily. Removing a friend can mean that they do not have access to certain portfolios of yours anymore. If you shared your portfolios with “Friends”, they will not see them anymore. If you shared a portfolio directly with this one former friend, they’ll still be able to view it. Verify that you have the correct person. Provide a reason for removing them from your list of friends. This information is optional. Click the Remove friend button to finalize your action or click Cancel to abort the removal.